Not so long ago, when you bought a PC with Windows 95 or 98 on it you received a disc along with it that you could use to reinstall the system if anything went wrong and you needed to replace the hard drive. That all started to change with the launch of Windows XP, when rather than a disc you'd find simply a partition on the hard drive with the system files on it, from which you could create a recovery CD or rebuild the system directly. This practice has continued with later versions of Windows and is compounded by the fact that many modern systems such as netbooks don't have a DVD drive to reload the system from. So what happens when you need to reinstall the system? We'll tell you. Most new systems prompt you to create a recovery disc the first time they're used, so if you've done so then you can boot from the disc and restore the system. Job done. But a lot of people skip this step either because they don't have a blank disc to hand, their PC doesn't have an optical drive or they're just feeling lazy. If you skipped this, you won't therefore have a disc handy when things go wrong. But don't worry, that's why we've written this guide. In most cases you can boot directly into the recovery partition via a hotkey sequence when the machine starts. How you do this varies between manufacturers, on Dell computers it's usually by pressing F12, for example, while some Lenovo systems have a special button on the keyboard. Your system documentation should tell you. Whatever way you get there, booting to the recovery partition will give you a number of options. These vary according to the manufacturer but there are usually tools you can use to repair the system - by rebuilding the boot sector, for example, or setting it back to its factory state. The problem with recovery partitions, of course, is that one of the most common causes of PC problems is a failed hard drive. This means that in most cases if the worst happens the recovery partition will have gone AWOL, along with the rest of your data. In the past, with an XP or Vista system, this would have meant that unless you had access to a Windows install disc from somewhere else you'd have been stuck or have had to resort to the darker corners of the web or pay out money to the PC manufacturer for a recovery disc. Now though, because so many modern systems come without discs, Windows 7 install media is available to download from Digital River. You will of course need access to another working PC to do the download. You'll need broadband too, since these are big files. Downloading like this has the added advantage that you get a version with the latest service pack rolled in, so you save time on doing updates once the install is done. Check the licence key label on your machine to ensure you get the right version of the OS for your system before you start to download. 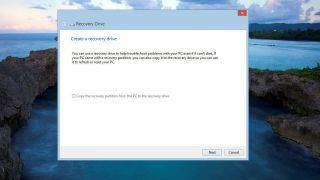 If you're planning on breaking your new Windows 8 system, make sure you've created the recovery media, as downloads aren't currently available and it looks likely that Microsoft will charge for replacement media. Once you've downloaded the appropriate ISO file from Digital River you can burn it to a DVD to create an install disc. If your PC doesn't have a DVD drive, or even if it does and you'd rather not use it, you can create a bootable flash drive by downloading the USB/DVD download tool.